With Belmont Park 149 races into the current meet, horse players can start to make some early bias observations. Let's see what's on the board meet today to identify any trends to give handicappers an edge. 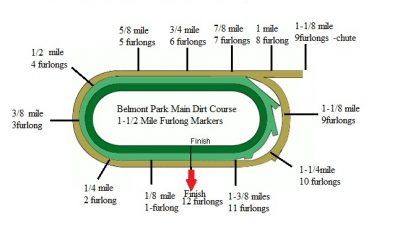 So far, Belmont has hosted 34 six-furlong, dirt races. A dozen (35%) have been won in wire-to-wire fashion. Overall, the eventual winner was third or less at the opening quarter-mile call 23 of 34 races (67%). On average, the winner at the distance/surface runs third at the 1/4 mile marker and 2.4 at the 1/2 mile marker. Based on the percentages, if you've identified a wire-to-wire candidate, it's a good bet if you can get 2-1 or better. Your odds improve if you take post position into account as 25 of 34 winners ran from the four hole and in. There have only been eight races, meaning the data set is slim. As a result, there is only one identifiable trend, six of eight winners ran from the four post and out. Otherwise, pace is split between early speed, stalkers and closers. Twenty races with nine gate-to-wire winners (45%). That's too high of a figure to ignore. It works out to about 6/5 odds, anything higher than that gives horse players a nice risk versus reward edge. Much like 6-furlongs, you'll want to stick with early-speed type as 70% of winners run first, second or third in the first 1/4 mile. The typical 1/4 and 1/2 mile calls are 2.84 and 2.55 respectively. Unlike 6-furlongs, you'll want to avoid the inside two posts as they've won only three races. The bulk of Ws leave the gate from posts three through six (65%). Keeping in line with the other dirt races, 7-furlongs belongs to front-runners. Eight of the 15 races went wire-to-wire (53%). That's 1-1 odds. Only three horses ran fourth or higher and managed to get to the wire first. Until that trend changes, DYI handicappers should ignore closers at 7-Furlongs on the dirt. The two horse has won six of the 15 races. Add in the two rail Ws, and the two-inside posts won eight of the 15 outings. Seven furlongs offers the greatest BIAS so far, inside speed is the way to go, especially a front runner leaving the gates from the two-spot. Early speed is still the dominant bias, but not in wire-to-wire fashion. Only three winners managed to go w2w. However, 12 of 18 to reach the tape first ran in the front three. Those are 1-2 like odds. Another 1-2 BIAS shows up in post positions, as well. Just like early speed, 12 of 18 winners left the gate from posts one, two, or three. That's by far the heartiest trend, inside early speed types must be strongly considered at your top choice on all tickets. Not surprisingly, 1 1/16th mirrors mile long dirt races, 11 of 16 winners ran in the first three at the 1/4 mile marker. Unlike one-mile runs, most of the winners, 11 of 16, came from the three post and out. The moral of the story, early speed types typically running third at the 1/4 and 1/2 poles, leaving from the three spot and out are your best bets to find a winner. You'll need to put on your handicapping hats here as this distance and surface plays evenly. Four of nine winners ran first or second from the jump and the remaining five ran fourth or more. We do find a little advantage when looking at post-position. Six of nine winners left from the four spot and out. Maiden races are the main type run at 1 1/16th on the grass with six of eight races looking for first-time winners. Stalkers are absolutely in play as seven of the eight to cross the line first ran second, third or fourth at the 1/4 pole. None have wired the field. Outside post positions are in play as well. Seven of eight broke from the fourth gate and wider. Four of the eight started from the eight hole and out. Stalkers that line up outside is where the money should be played. Hopefully, these BIAS insights help you find more winners. You can also use them in conjunction with our picks to help put your tickets together. GET OUR FULL CARD BELMONT PARK PICKS PLUS ALL OTHER TRACKS!